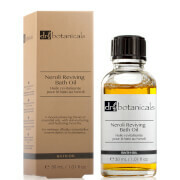 This concentrated bath treatment is soothing for tired and sore muscles. The Juniper herb formed the legendary “magic wreath” which Romans used to ward off evil spirits. Juniper, an evergreen shrub, helps rid the body of toxins and stimulates circulation. This soak also relieves tension and stress. Juniper is known to have an anti-inflammatory effect. Use Juniper after sports or any strenuous activity where you are anticipating sore muscles or tiredness due to over-exertion. Improves circulation and relieves muscle tension. Benefits both body and mind through skin absorption and inhalation. This is wonderfully fragrant -- the juniper and wintergreen are so complementary, yet I've never found them together in a bath product before. Works great too. I use alone to relax, or with some Epsom salts for a full therapy bath to soothe sore muscles.